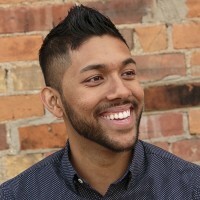 is a musician and full-stack web developer from Toronto, Canada who studied Computer Science and Linguistics at the University of Toronto. Software dev manager, web designer, hobby photographer, aspiring writer, Jesus follower. Father to 3 boys, Husband to 1 wife. #Startup Enthusiast, Web Developer, @BitmakerHQ Instructor • Program Development Lead at @WomenWhoCodeTO • Learn. Code. Share. Repeat.